Não adianta tentar achar comparações com quem quer que seja no mundo do Rock! O camarada canta e toca guitarra como ninguém. Em geral interpreta Rock dos anos 50, Blues e Instrumentais autorais e releituras de clássicos. Joanatan tem sua própria maneira de executar a sua música, deixando no coração de cada música uma interpretação de dentro para fora. Seu amor pela música de raiz americana torna-se evidente, mostrando um talento incrível, que nunca esgota. Ele escreve música com sensibilidade e a executa com pungência e espontaneidade. Joanatan inspira-se em grandes nomes dos anos 50 e início dos anos 60, tais como, Elvis Presley, Bill Haley, Buddy Holly, Little Richard, Gene Vincent, Jerry Lee Lewis, Buddy Knox, Ritchie Valens, Carl Perkins, Tommy Sands, Everly Brothers, Ricky Nelson, Bobby Darin, Rudy "Tutti" Grayzell, Johnny Kidd and The Pirates, Billy Fury, Johnny Burnette Trio, The Ventures and The Shadows somando tudo isso ao clima de filmes "B" dos anos 50 e 60, mais Blues, Surf Music, Jazz. Don't try to find comparisons with any other guy anywhere in rockin' space! This feller plays guitar and sings like no other. 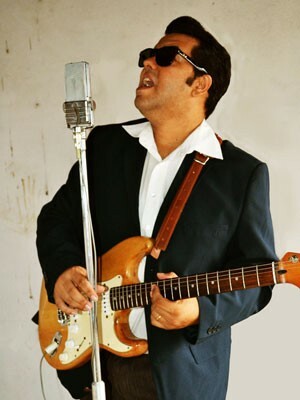 He mostly performs "50's Rock 'n' Roll", Blues and Instrumentals tunes as well his own compositions. Joanatan has got his own way to perform his music, getting into heart of each song interpreting it from the inside out. His love for the American Roots music becomes evident, he shows a awesome talent that may never be fully exhausted. He writes sensitive music and performs with poignancy and ease. Joanatan, draws from the greats of the 50’s and 60’s such as Elvis Presley, Bill Haley, Buddy Holly, Little Richard, Gene Vincent, Jerry Lee Lewis, Buddy Knox, Ritchie Valens, Carl Perkins, Tommy Sands, Everly Brothers, Ricky Nelson, Bobby Darin, Rudy "Tutti" Grayzell, Johnny Kidd and The Pirates, Billy Fury, Johnny Burnette Trio, The Ventures and The Shadows and fuses them with B-movies, Jazz and Blues. Joanatan Richard Prepara Mais Um Lançamento Em Vinil!